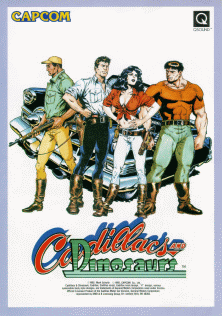 Cadillacs and Dinosaurs, released in Japan as Cadillacs Kyouryuu Shinseiki is a 1993 arcade game by Capcom. Players select one of four characters: Jack Tenrec (balanced type), Hannah Dundee (skill type), Mustapha Cairo (speed type) or Mess O'Bradovich (power type), each with their own strengths and weaknesses, as well unique attacks. Up to three players can play at once. Players guide their selected characters through eight stages, battling various enemies and bosses, ending with Dr. Simon Fessenden. The game's titular dinosaurs make appearances as neutral characters that may attack both player characters and enemies. In Cadillacs and Dinosaurs the player has access to several attacks. Each character has two special moves including one that depletes a character's health upon contact with an enemy and When two or more players play together, they can trigger a team-attack. Players can also find and use firearms, throwing weapons such as rocks and explosives, as well melee weapons such as clubs.